Is a Chiro or Physio best for me? Chiro or Physio? Which is best for back pain? One friend will tell you that chiropractors are best, while another will say that physiotherapists are the best. 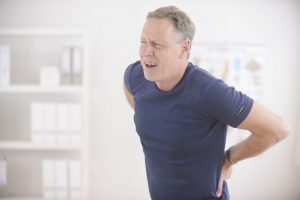 This advice, however well-meaning, can be very confusing when you are suffering from low back or neck pain, headaches or aching joints and want to get the best treatment. In this blog, we will outline the similarities and differences between the two professions when it comes to spinal problems. Once you have a broad understanding of these professions, you can then decide which one is the most appropriate for you. Chiropractic care’s primary aim is the removal and prevention of musculoskeletal-related problems. They achieve this by restoring normal functional movement to the spine and strengthening the surrounding structures. This will lead to improved muscle and nervous system function and contribute toward long-term health and well-being. Physiotherapy primarily aims to rehabilitate and improve a person’s ability to move and function to reduce pain and improve long-term health. Like chiropractors, they also believe that this will lead to long-term health and well-being. As you can see their goals are essentially the same. WHAT DO THEY AGREE ON? They also agree that maintaining good spinal function can prevent degeneration of the spine and improve your quality of life. Both Physiotherapy and chiropractic are university-based full-time degrees. Chiropractic is a five-year full-time degree while Physiotherapy is a four-year full-time degree. The Chiropractic degree focuses specifically on spinal structure, function and control, more than any other degree in health care. Chiropractors are extensively trained in the orthopaedic, neurological and functional assessment of the spine. They learn a wide range of specific spinal techniques, ranging from those that involve manipulation (cracking) to others that involve no manipulation at all. Physiotherapists are trained in basic spinal treatment however they receive little or no training in spinal manipulation. Some physios choose to do a postgraduate course in manipulation. The Physiotherapist degree has a much wider scope of training than the chiropractic degree. While they are mostly known for their treatment of sporting injuries, such as joint sprains and muscle tears, physios also work extensively with people recovering from a stroke, women’s health issues, post-surgical rehabilitation and diseases such as osteoporosis, cystic fibrosis or multiple sclerosis. 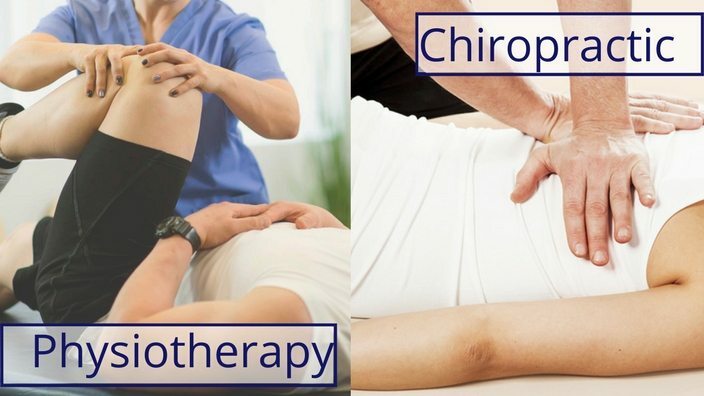 These differences are why chiropractors are generally perceived as the specialists in assessing, restoring and maintaining spinal function while physiotherapists are perceived as the specialists in the treatment of sprains, strains and the rehabilitation of a wide variety of medical problems. 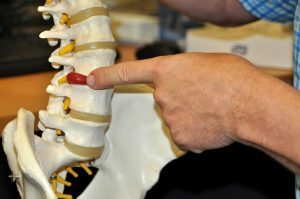 Do they assess spinal problems differently? The best treatment is always based on an accurate diagnosis of ongoing assessment of your problems. Treatments are one of the most significant differences between the two professions. While both professions agree that treatment should not be focused only on the painful area their methods of actually treating spinal problems do vary. Chiropractic treatment usually consists of gentle forces being manually applied to the vertebrae to restore normal motion to the spine. These treatments are typically combined with specific stretching and strengthening exercises. Physio treatment is usually based more around making changes in the soft tissues around the spine. It usually involves stretching exercises, massage and dry needling (acupuncture). Most physios do not use specific spinal manipulation to restore normal spinal movement. They both use essentially the same exercise programs, nutritional advice, and ergonomic and postural advice. WHO IS THE BEST TO SEE? A thorough review of your spine problems. X-rays or other tests, as required, to get an accurate diagnosis. Your treatment options fully explained to you. Exercises to assist your recovery, preferably demonstrated on video for your convenience. A treatment plan finishes with a comparative exam to assess your progress. If you found this blog useful, please let us know in the comments below. We love hearing from you and appreciate any constructive criticisms or advice you can give us.